027 - USA - 2015 - John Macs Travel & Photography. 027 - USA - 2015. 027 - Winslow & Flagstaff, Arizona, USA - 2015. After breakfast we got a good start this morning. We stopped off in Winslow, Arizona, and visited "The Standin On The Corner Park"
A fantastic little town on Route 66. immortalized in a song "Take It Easy" by the group The Eagles, in 1972. We had a look around Winslow, Arizona, before we continued on our way to Flagstaff, Arizona. 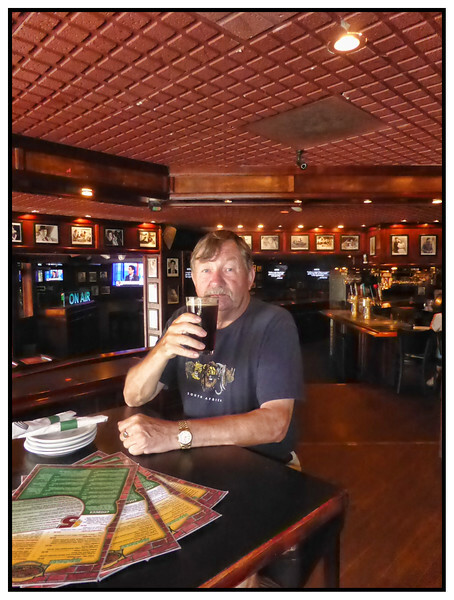 We got checked into our motel, then we looked around Flagstaff Historic Quarter, this was very interesting, we took some photo's before having a beer at one of the local bars "Maloney’s Tavern", then heading for dinner at The Country Host Restaurant next to our hotel. Finishing off the day with a couple of beers. We are spending the night in Flagstaff, Arizona, before heading to Tombstone, Arizona tomorrow morning. Scona @ Maloney’s Tavern, Flagstaff, Arizona, USA - 2015.